At last, a natural long-stem fiber diet for Tortoises. Zoo Med is proud to announce the Natural Grassland Tortoise Food and the Natural Forest Tortoise Food. 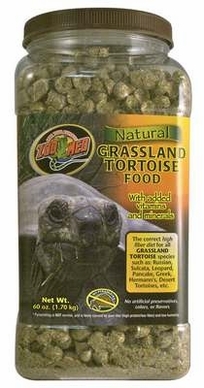 These new formulas contain long-stem fibers an important part of Tortoises natural diet. Only Zoo Meds new food contains this necessary fiber which is not found in any other commercial food. This new Natural food also contains nutritious Dandelion Greens, Yucca and other plants that tortoises love! Additional Information: Formulated for Russian, Greek, Sulcata, Leopard and Pancake Tortoises.